Antique French Napoleon III Pocket Watch or Jewelry Casket, Kingwood Marquetry. 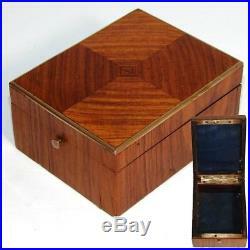 Antique French Napoleon III Pocket Watch or Jewelry Casket, a Lovely Kingwood Marquetry Box. All items and photos are the express property of Antiques & Uncommon Treasure. No reproduction without prior written consent. We'll be sending out sale notices and special deals to our'Favorites' customers. Fine antique French Napoleon III era pocket watch or jewelry casket, an elegant little box with kingwood marquetry style veneers and brass edging! A place for everything, and everything gloriously in its place - and no excess is too much; that seems to have been the rule of the day. And the day was 1840-70s Napoleon III era, France, the birthplace and time for this superb likely pocket watch box, casket. Entirely made in fine old box wood, then veneered in kingwood in a diamond shaped grain pattern and trimmed out with a small brass lid edging! The interior has what appears to be the original navy blue moire silk lining top & bottom but no fitting to actually cradle a pocket watch (and no signs that there ever was). A fine example of the era, aesthetic, and immense allure these old pieces represent. Wildly popular in France and abroad, these glorious old cabinetry pieces proliferated in Napoleon III era France, and we reap the benefit of their popularity and appeal still today in those that survive. One of four fabulous old pocket watch caskets that we've recently just added so, be sure to browse some while you're with us. While on the subject of fine antique boxes, by the way, I MUST mention to you a fabulous newly published reference book by our friend and customer, Genevieve Cummins of Australia. Over the past several years, Genevieve has been working on a masterpiece of a book, which we've just recently received copies of. We're pleased to see our own shop noted in many of the pages, and to revisit so many exceptional antique boxes we've had over the years. Be sure to order it. The title is: "ANTIQUE BOXES, Inside and Out". Hot off the presses, it's got 429 delicious pages of boxes. A small veneer chip on the bottom of the back and some thin age or drying splits to the veneer in a few spots (all visible in the images). There is also a split in the bottom wood panel (box bottom). And your ranking of our performance is also very important! We wish to keep our 4.9 - 5 star ratings in all categories. We always insure our items BUT, more importantly, pack them extremely well knowing that most are not replaceable. Please remember that when leaving DSR ratings. Icon here or above to see more of our inventory, offerings and venues. We have a HUGE assortment of the finest antiques to be found online, all at your fingertips with Antiques & Uncommon Treasure. _gsrx_vers_631 GS 6.9.8b6 (631). The item "Antique French Napoleon III Pocket Watch or Jewelry Casket, Kingwood Marquetry" is in sale since Friday, December 22, 2017. This item is in the category "Antiques\Decorative Arts\Woodenware\Boxes". The seller is "antiquesuncommontreasure" and is located in San Marcos, California. This item can be shipped worldwide.